Sleeping in public is an acquired skill. One must accept the very real possibility of snoring, talking, drooling, farting, maybe even walking. People who can fall asleep at a moment’s notice on any surface, be it a brick floor, or a pain inducing chair, are to be admired. Sometimes, though, necessity strikes. Try as you might, sleep will eventually find you. And if you’re anything like I am, the type of traveler who will avoid sleeping in public at all costs, the idea of exposing your sleeping self to the world is horrifying. I snore. I talk. I drool. I fart. And I walk. I bring this topic up because I’m sitting here at Kansas City International waiting for a connecting flight. This place is built like a concentration camp. Cold interior. Stiff chairs. Nowhere to take a nap. And I’m freaking tired. Mad public sleeping skillz I never knew I had. Why, in this hyper connected world we live in, are there no databases solely devoted to comfortable spots to sleep in public, especially at airports? Do you know of any good places to crash in public? I’ll kick this international database off: There are rows of padded chairs with no armrests downstairs near the Star Peru gate at Jorge Chávez International Airport. I’m just doing my part to make the world a better, more sleep friendly place. Sleeping in a park used to be a relatively safe bet, with all the convenient grass and snug bushes to conceal yourself in. Recently, however the preferred sleep accommodations for many of our homeless cohorts across the country have been infiltrated by a rag tag bunch of youths identifying themselves as the “Occupy Movement”. I am unsure of their message or meaning but I do know that they are occupying the hell out of some previously comfortable ground space. It is quite an inconvenience for our nation’s homeless to be forced to share their castle with these “occupier” hippies. It is no longer a simple matter of getting drunk on Night Train and blacking out behind a row of arborvitae. Now the denizens of the parks must compete for space with urine soaked, sign waving, loud mouthed dissidents of the stoned and belligerent variety. Gone are the days of spanging for enough nickels to buy a 40 oz of malt liquor and quietly passing out in a warm puddle of your own urine. Now these poor people must get drunk on cheap liquor and pass out in puddles of other people’s warm urine. Getting hammered and blacking out in a public park is not nearly as much fun now that the Occupy Movement has set up camp. Perhaps recent police activity will soon reclaim the city parks for their proper inhabitants: drunk, belligerent and sometimes schizophrenic homeless addicts and prostitutes, and the police can go back to harassing them. Is that seriously you? Dressed in shorts for your return to the Midwest? You definitely are sleep deprived. That is me. Seriously. But that’s in Peru. I had about 30 more layers on yesterday. You’re right, we do need this kind of database! I usually try to find a chair up against a corner so I can keep my head from flopping around as I snooze sitting upright! That’s all it takes for you? A chair up against a corner? I wish it was that easy! My dad is one who can fall asleep ANYWHERE the second he rests his head. I, on the other hand, have a fart/snore/drool/walk/talk/mouthopenwideforanyonetosticksomethinginit phobia like you. However (to add to your new database), I recently came across awesome, cushioned “beach” chairs in the old section of the Beijing airport hidden behind a row of plants (near Gate 1). Too bad I arrived late and only had a few minutes to take advantage. I have a buddy who is just like your dad. He can sleep anywhere, and on anything. It’s really annoying. And not only that, after he falls asleep instantly he snores like there’s no tomorrow. Cushioned beach chairs at an airport? This database is getting good already! LOL! Nice post and great idea! 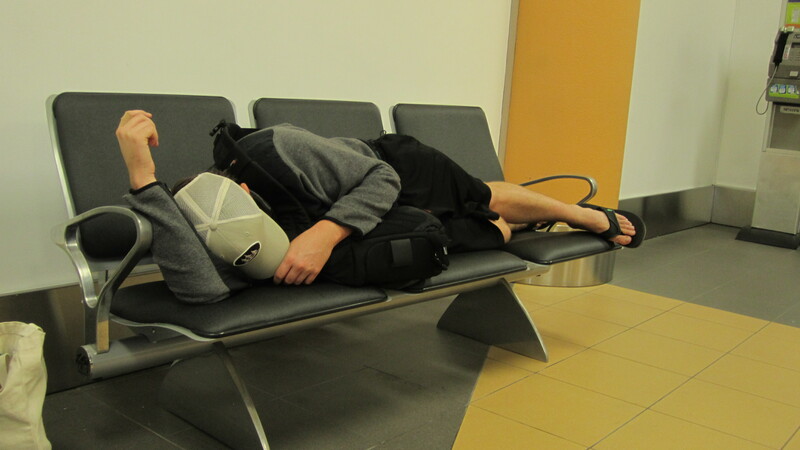 I can sleep anywhere, however this database would be very helpful to us solo female travelers…for obvious reasons. I checked on couchsurfers and there’s no such database there (that I was able to find). I’m jealous of your type. How do you do it? Complete exhaustion is the only way I can manage to fall asleep in public. Nothing on couchsurfers, eh? Maybe we’re onto something. A database sounds like a great idea. Funny. My son and I decided that we needed to make a pit-stop blog for NYC with ratings. There’s never a bathroom when you need one, and it could help in the case of emergency. Brilliant! Our database has to start somewhere. i thought the same thing. like who could EVER sleep in public?! i went to a very liberal college so many people slept on the grass, benches, under a tree, etc. so finals week……i was SO tired. like beyond tired. beyond exhausted. u get the hint? i fell dead asleep on a bench outside and i covered my face with my jacket so no one would see me. fail. i tossed and turned in my sleep and i ended up on the ground. WHOMP. who cares. i was tired. and it was my last semester : ) happy blogging! Hey, at least you weren’t drooling. That you know of. And where is this magical campus of liberal sleepers casually passing out here and there like it’s no big deal? I have a feeling I wouldn’t fit in there. We had a 9 hour layover in the Lima airport on the way here, and did not discover the “sleeping area” downstairs until we were in line to board our next flight to Cusco. After staying miserably awake all night in the food court upstairs. This is a database that needs to exist! We did the exact same thing! We pretended like we could get some sleep upstairs in the food court, but eventually we had enough and went in search of an alternative. That’s when we found those comfortable chairs downstairs by the Star Peru gate. This database we’re talking about would’ve prevented your miserable all-nighter, and us walking around aimlessly for too long. Love the idea! I travelled around the States on a Greyhound Bus which can be a pretty cush ride compared to siamese, conjoined hardback chairs you find in the airports. Oddly enough the hardest part is to NOT fall asleep because you’re quite certain the dude who sat next to you just murdered a thousand puppies upon his recent release from jail. Chance are highly likely the dude next to you on the ‘hound did just murder a thousand puppies. And he will probably try to sell you a puppy fur coat at some point during your trip.